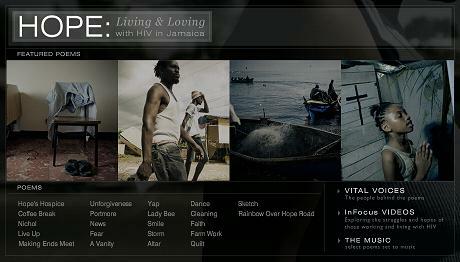 Pulitzer Center’s multimedia website on the human face of HIV/AIDS in Jamaica has won an Emmy for new approaches to news and documentary programming, in the arts, lifestyle and culture category, announced Sept 21, at the 30th annual News & Documentary Emmy Awards at the Lincoln Center’s Rose Theater in New York City. LiveHopeLove.com, an interactive site based on Kwame Dawes’s Pulitzer Center project, HOPE: Living and loving with AIDS in Jamaica, has won other accolades including a People’s Voice Webby Award, and was the inspiration for the music/spoken word performance Wisteria & HOPE which premiered at the National Black Theatre Festival in North Carolina on Aug. 6-7. The website features the poetry of Ghanaian-Jamaican writer Kwame Dawes, the author of over a dozen collections of verse and numerous plays, essays and books. He is the distinguished poet in residence and Louis Frye Scudder Professor of Liberal Arts at the University of South Carolina. This overall project combines extended essays, two short documentaries, a one-hour radio documentary, a collection of poetry inspired by his reporting, the performance of the poems set to music and LiveHopeLove.com.